In a midsession reversal (MSR) task, animals are typically presented with a simple, simultaneous discrimination (S1+, S2−) where contingencies are reversed (S1−, S2+) half-way through each session. This paradigm creates multiple, relevant cues that can aid in maximizing overall reinforcement. Recent research has shown that pigeons show systematic anticipatory and perseverative errors across the session, which increase as a function of proximity to the reversal trial. This behavior has been theorized to indicate primary control by temporal cues across the session, instead of the cues provided by recent reinforcement history that appear to control behavior shown by humans. 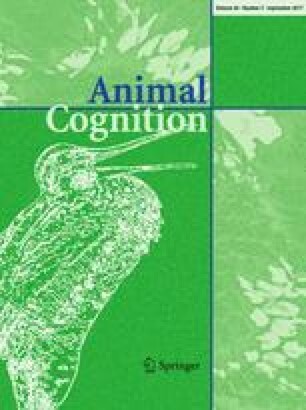 Rats, however, appear to be guided by recent reinforcement history when tested in an operant context, thereby demonstrating behavior that parallels that seen in humans, but they appear to be guided by temporal cues when tested in an open-field apparatus, showing behavior more akin to that seen in pigeons. We tested rhesus macaques (Macaca mulatta) on the MSR with a computerized simultaneous visual discrimination to assess whether they would show errors indicative of control by time or by recent reinforcement history. When a single reversal point occurred midsession, rhesus macaques showed no anticipation of the reversal and a similar level of perseveration to rats tested in an operant setting. Nearly identical results also were observed when the monkeys were trained with a single, variable reversal point or with multiple, variable reversal points within a session. These results indicate that temporal cues are not guiding response flexibility in rhesus macaque visual discrimination. The authors thank Mattea Rossettie for her assistance with data collection with the monkeys. The authors also thank Ali Qadri and Robert Cook for their advice and assistance with data analysis. The corresponding author, Dr. Rebecca M. Rayburn-Reeves, was supported by a grant from the US National Eye Institute (#RO1EY022655) to Robert G. Cook (Email: Robert.Cook@tufts.edu). The remaining authors, Ms. Brielle T. James and Dr. Michael J. Beran, were supported by a grant from the US National Institutes of Health (HD060563). All applicable international, national and/or institutional guidelines for the care and use of animals were followed. All procedures performed in studies involving animals were in accordance with the ethical standards of the institution or practice at which the studies were conducted. This article does not contain any studies with human participants performed by any of the authors.